There’s a much better argument. It’s that passing health care reform offers Dems, in the not-so- long term, a chance to do more than avoid Republican attacks. It offers the chance to disprove them. For months, both GOP and Fox hosts have been talking about socialized medicine and death panels and vicious Medicare cuts and the government coming between you and your doctor, etc. If Democrats pass the bill and none of this happens, Republican opponents will be more than defeated. They’ll be discredited. Mickey has apparently forgotten that the Democrat plans raise taxes immediately, but start giving their “benefits” only around 2013. So if the Democrats pass one of those bills, then for the next three years people will be facing higher taxes, and the threat of what will come, but they won’t be getting any of this “reality” that Mickey claims to think will disprove the Republican claims. If that’s not a setup for an epic fail, I can’t imagine what would be one. P.P.S. : OK, you say. If Dems pass reform and the sky doesn’t fall, that might help them in the semi-near term. But how would it help them this November, when many will be facing what looks like an impressive wave of popular discontent? One answer is to look at the public’s response to the “stimulus” bill. It was unreasonable to expect last year’s package of spending to have an immediate effect on the unemployment rate. But when the unemployment rate didn’t fall, did voters say “Well, let’s give it another year and see”? 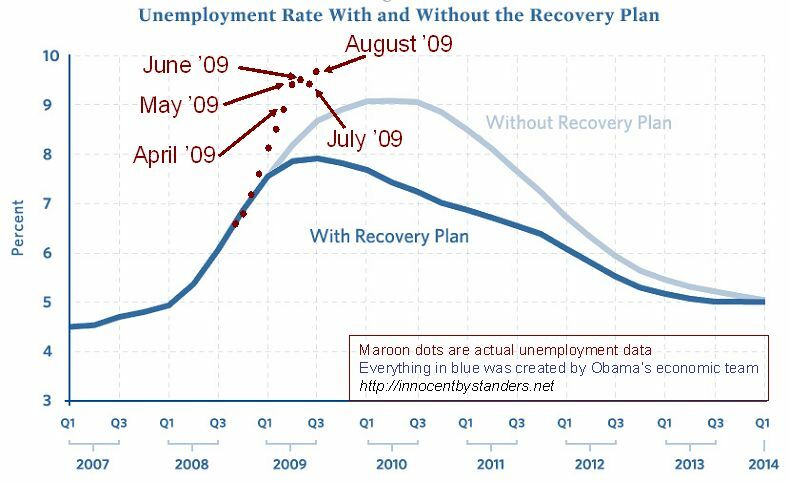 Or did they start to think the stimulus was a flop? Answer: flop. Similarly, if health reform passes and nothing much changes, they will very quickly start to suspect that the GOP predictions of doom were bogus. The voters judge the “Stimulus” a failure because it did not meet the Democrats promises. The Republicans aren’t saying all the bad things will happen immediately (other than taxes being raised). Since the things the Republicans are saying are going to happen will, in fact, happen, this will give the rest of the Republican predictions more credibility, not less. In short, if the Democrats want to pass this monstrosity, I’m moer than happy to have them so thoroughly shoot themselves in the foot. Because President Palin will be happy to sign a law undoing all the Democrats changes (which won’t have kicked in before she wins the 2012 election), and the Republican’s filibuster proof majority in teh Senate will pass repeal in about two weeks. A big part of what led General Motors and Chrysler into trouble in recent decades were the huge costs they racked up providing health care for their workers — costs that made them less profitable and less competitive with automakers around the world. If we do not fix our health care system, America may go the way of GM — paying more, getting less, and going broke. When it comes to the cost of our health care, then, the status quo is unsustainable. Er, yes. Which is why no one could understand why Barack Obama kept sinking tens of billions of taxpayer dollars into GM while its pension and health insurance obligations never got addressed. It’s also why we all wondered why Obama perverted the bankruptcy process in order to favor the unions, who insisted on those big, expensive pension/benefits packages that made GM uncompetitive in the domestic and global market. GM has a”gold plated” health insurance plan for its members, and ObamaCare will allow GM to dump the plan, and stick its employees with the national plan, instead. GM has a”gold plated” health insurance plan for its members, and since it is required by their contract, GM will continue to pay for that plan. GM has a”gold plated” health insurance plan for its members, and through the miracle of ObamaCare, the employees will get to keep that plan, subsidized by the rest of us taxpayers. GM has a normal and reasonable insurance package, and something similar will be extended to everybody. The only way this will happen is if the US bans all private insurance / health care, and forces everybody to be part of the National Health System, and, like Canada, forbids health care providers to do business outside of the government run health care system. If we were to do this, then GM would probably save money. But Obama swears up and down that he’s not going to do that. Taxes will have to go up to pay for ObamaCare. Which means employees will be fighting for higher wages just so they can keep their standard of living the same. Taxes will have to go up to pay for ObamaCare. Which means that everything GM buys will cost more, raising the cost of its cars compared to cars made in Japan (where their taxes aren’t going up to pay for ObamaCare). We expect that ObamaCare will raise costs for the private health insurance companies. Those costs will be passed on to GM. I suppose Obama can try to do this. OTOH, I can’t think of a quicker way to destroy the Democrat majority in Congress than to announce that union health plans would get a special subsidy that the rest of us don’t get, and I can’t think of a quicker way to bankrupt the US than extend those subsidies to 50%+ of the country. the idea behind ObamaCare is to extend health insurance to those who currently lack it. Which is to say: to increase the amount of money we’re going to spend on health care, and thus increase taxes so the government can pay for all those people’s health care. Who’s going to be paying those taxes? Why, GM, and its employees. And its customers and suppliers. See #2 for the problems with that. In short, one of the competitive benefits US Companies have is the smaller size of the US governments (Federal, State, and Local) compared to Europe, and thus the lower costs that government imposes on all of us. Making the US Government bigger is not going to make us business more competitive. You are currently browsing the archives for the Heath Care category.